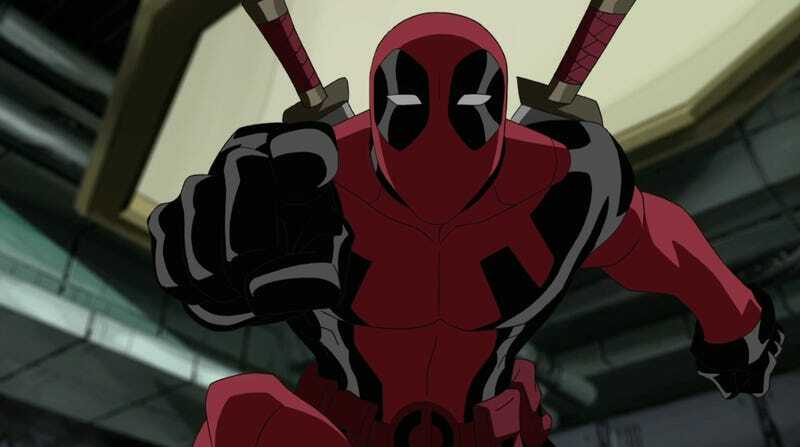 Animated Deadpool (from DisneyXD’s Ultimate Spider-Man) knows what you did, Marvel. One of the nice things about a big, media-friendly event like the TCA press tour (currently rounding the corner into its final week of press release-unleashing hell) is that you can sometimes directly ask the people who make decisions about the TV you love why they did all those terrible things to the TV that you love. Or just could have loved, in the case of Donald Glover’s animated Deadpool series, which—from the extremely brief, possibly sarcastic glimpses we’ve gotten—seemed like it had the potential to bring something fittingly subversive and weird to the world of Marvel TV. Unfortunately, the show got abruptly yanked from FX’s hypothetical schedule back in March, a move that provoked a notably pissed-off reaction from Glover himself, who ended up tweeting out an (again, possibly entirely tongue-in-cheek) script for an episode of the series, and tersely noting “I wasn’t too busy to work on Deadpool.” For the last few months, it’s been an open question why FX—which enjoys a positive working relationship with Glover, the mind behind its critically beloved Atlanta—decided not to move forward on the series. As it turns out, it wasn’t their call to make. If the script Glover tweeted out was at all representative of the material he and his brother Stephen had written for Marvel to consider, it’s not wholly surprising—while still being pretty disappointing—that the Disney-owned company balked. Unless you’re hunting for subtext, the Marvel properties typically strive to be about as blandly apolitical as humanly possible, which is more-or-less the antithesis of Glover’s artistic mission and brand. Or, to put it another way: We have to assume the company was expecting more “Chimichanga!” and meta gags about Ryan Reynolds, less commentary on racial identity in America. Which is a shame, since it’s not like we’re lacking for fun, light comic book content these days, and something with a bit more bite to it—and Glover’s exhausting inventiveness behind it—could have been a welcome change of pace. Deadpool creator says Donald Glover&apos;s version would&apos;ve been "brilliant"